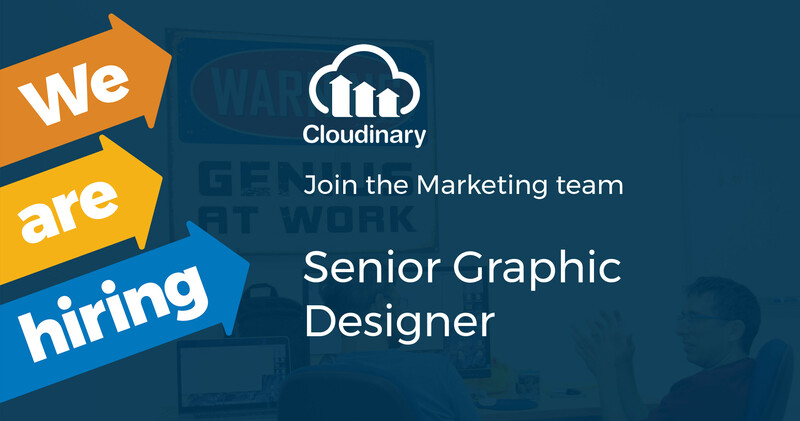 Cloudinary is excited to find our first in-house designer. In this role, you will be empowered to develop Cloudinary’s brand identity across multiple marketing touchpoints, including our public-facing website, collateral, presentations, events, and more. Because the power of visual storytelling is at the root of everything we do we cannot understate the value we see and have in good design and visual assets. You must be comfortable working as part of a team and independently to accomplish your creative milestones and KPIs. Creating a unified brand identity across diverse marketing assets. You'll have the chance to evolve and extend the company's identity utilizing your creative abilities to support our unique position in the marketplace and differentiate Cloudinary from our competitors. Designing our marketing collateral, emails, and website. You'll be the go-to source for anything our customers and prospects engage with, responsible for designing and templatizing marketing collateral and emails that are easily replicable, and responsible for evolving the design and look and feel of our website, including our blog. Attracting customers to our service. You’ll work closely with demand gen and digital marketing to craft lookbooks, landing pages, eBooks, social media campaigns, and other go-to-market assets that drive visibility for and interest in our various solutions. Designing internal & external presentations. We pitch customers in person and virtually. You'll be responsible for creating new designs and templates for the sales and marketing teams to help us put our best foot forward with our future customers. Partnering with the product UI/UX team. To create a consistent and compelling brand identity across all parts of Cloudinary, you’ll be expected to work closely with the product UI/UX team to ensure our brand identity flows consistently across our cloud service as well as our marketing assets. This is a senior level position, and as such, we're looking for someone who understands design's function in an organization, who is creative and innovative, and strives to learn and pursue skills outside of their previous experience. We want you to come in and hit the ground running, develop and grow within the company, while creating a unique and memorable brand identity in the process. Portfolio: you have 8+ years of experience on a marketing or product team. You understand the purpose of marketing and product design and have demonstrable talents in your experience at other companies. Your portfolio contains obvious knowledge of UX/UI, wireframes, screen flows, and marketing designs. Web savvy: You’ve worked on web projects and understand not just concepts around design, but the relevance of responsive layouts and the like. Self-starter: you're able to work successfully within a team structure and independently. You're able to take a project from inception to execution and are comfortable taking initiative on your own projects. Process-oriented: you understand that for everything to work seamlessly, it's essential for processes to be in place and to be consistent. You have examples of owning and creating processes in a previous position or extracurricular activity. Organizational skills: you can move between tasks effortlessly, and enjoy a fast-paced environment. A typical day may include commissioning a piece of artwork for a white paper, designing a presentation for a customer pitch, coming up with creative ideas to display Cloudinary in a tradeshow booth, and giving a presentation on a project you completed to the rest of the company. Knowledge of design programs: Proficient in InDesign, Illustrator, Photoshop, Sketch. It's not essential, but if you also have knowledge in these platforms, we'd love to speak with you: InVision, AdobeXD or similar, as well as HTML email design. Passionate: you have a demonstrated enthusiasm for all things design. You're curious, you want to know how everything fits together, and have a passion for learning new skills. Great communicator and project manager: Some of the projects you take on may have key stakeholders in geographically separate offices. You'll be expected to use project management tools to ensure you're keeping those tasks on track even with various time differences.